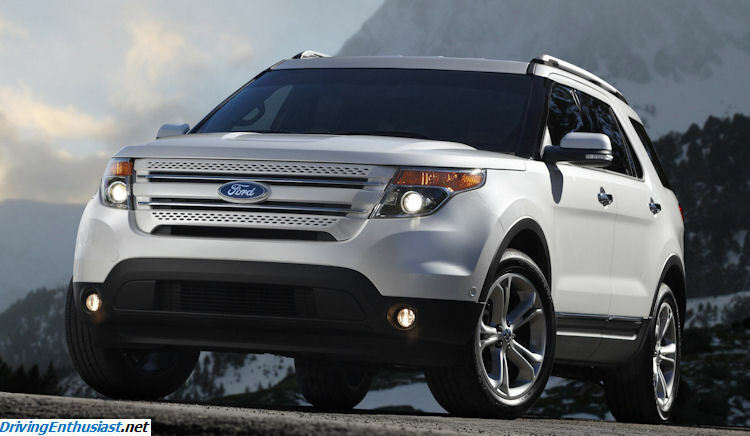 Ford has issued a large number of press releases and images detailing the all-new 2011 Ford Explorer and even more will be coming later in the day Monday. While this is hardly a “DrivingEnthusiast” type of vehicle, the technical aspects of it are interesting to Ford enthusiasts. If you’ve haven’t heard by now that Ford has switched the Explorer to a unibody design – effectively a CUV instead of an SUV – then you’ve been off the planet, in prison, or without the Internet. More interesting news: the front suspension is a short/long arm independent, instead of the Taurus platform-mate McPherson strut. This is not simply a rehash of the Ford D3 platform. Very encouraging to see that Ford spent the money in this way (and note that the Explorer suspension continues the tradition of being technically more sophisticated than the Mustang). Ford has not yet provided a weight. Brake sizes were not provided. The V-6 model will tow 5000 pounds and features trailer sway control similar to the F-150. Unfortunately, Ford has not yet released images of the new EcoBoost engine. Hopefully those will be coming later. Ford Explorer – the vehicle that defined a segment – has been completely reinvented, raising customers’ expectations of sport utility vehicle (SUV) fuel efficiency, safety, technology, capability and quality. The all-new Explorer launches today to its Facebook friends in a unique social media initiative, followed by reveal events throughout the U.S. and Canada. The 2011 Explorer with V6 power is expected to deliver more than 20 percent better fuel economy than the 2010 model, shattering conventional expectations for SUV fuel efficiency. When equipped with the available 2.0-liter EcoBoost™ I-4 engine, Explorer fuel economy is expected to improve by more than 30 percent and exceed the 2010 Honda Pilot and 2010 Toyota Highlander V6. 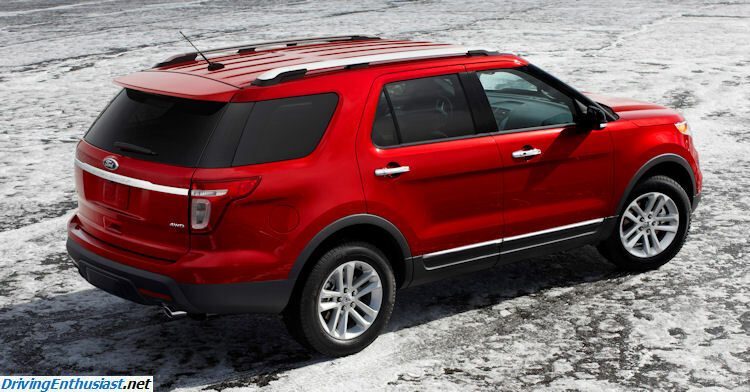 Chief Nameplate Engineer Jim Holland said the team targeted two key objectives when developing the 2011 Ford Explorer. Weight reduction is a key element in improving Explorer fuel efficiency. While adding significant content to the vehicle, engineers were able to reduce total vehicle weight by almost 100 pounds through the use of lighter materials such as an aluminum hood. Explorer weight loss is even more impressive, as the latest versions of Honda Pilot and Toyota 4Runner have added pounds versus previous models. Explorer’s available advanced 2.0-liter EcoBoost I-4 delivers the power of a normally aspirated V6 without compromising four-cylinder fuel economy. Aimed at the SUV buyer whose top priority is fuel economy, this turbocharged and intercooled I-4 engine delivers a projected 237 horsepower at 5,500 rpm and 250 lb.-ft. of torque from 1,700 through 4,000 rpm. The EcoBoost employs direct injection of gasoline, Ti-VCT, direct-acting mechanical bucket (DAMB) valve lifters and four valves per cylinder. Explorer’s standard powertrain combines front-wheel drive with a 3.5-liter Ti-VCT V6 engine, delivering an estimated 290 horsepower and 255 lb.-ft. of torque. Ti-VCT allows individually optimized camshaft timing of valve opening and closing events to improve mechanical efficiency while delivering increased power and reducing part-throttle emissions. Mated to a six-speed automatic transmission, this powerful, flexible and efficient V6 is projected to deliver more than 20 percent better fuel economy versus the previous Explorer V6 model. Explorer’s variable-displacement air-conditioning compressor provides a fuel economy benefit with less drag and smoother transition for improved driveability. Each Explorer engine is paired with a unique six-speed automatic transmission, combining lowered initial gears for improved off-the-line acceleration and higher gearing for improved efficiency at lower engine rpm when cruising. Explorer V6 models are available with an intelligent 4WD system that adds terrain management. Situation-selectable, this powertrain advancement takes the guesswork out of 4WD range choice. A driver need only turn the console-mounted knob to the proper setting among snow, sand, mud and normal modes. This system also includes a hill descent mode. Simpler and more convenient for SUV veterans, the system will be a confidence-builder for drivers new to the segment. In addition to its clean, modern design inside and out, Explorer aims to please SUV shoppers with a thoughtful, flexible interior package that abounds with clever storage capacity. The new SUV features more head and shoulder room, three rows of flexible seating, and room for everything families want to take along on their adventures. The Explorer design – inside and out – is executed with world-class craftsmanship. Tight margin gaps are just one indication of the immense attention to detail applied to craftsmanship across the spectrum, from design to engineering to manufacturing. The Chicago facility where Explorer will be produced raised the bar on initial quality measures with the recent Taurus launch, which is good news for customers. 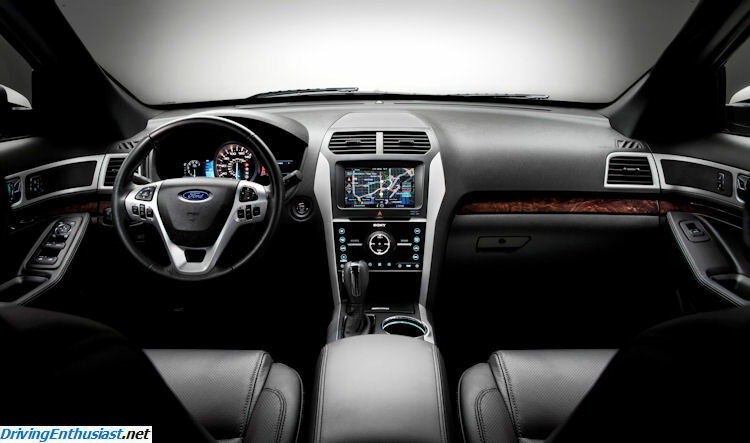 Quietness – another profound advancement in the all-new 2011 Ford Explorer – also will signal quality to customers. The team enhanced noise, vibration and harshness (NVH) control for the all-new Explorer using an advanced technology called NoiseVision. A ball with hundreds of tiny cameras and microphones, NoiseVision allows engineers to pinpoint and address potential noise issues earlier in the development process. Explorer is expected to be superior to in-segment competitors and rival premium SUVs in quietness and NVH control. The all-new Explorer targets top safety ratings with a stiff unibody structure and a class-leading suite of active and passive safety features and technologies, plus another Ford safety innovation – the world’s first second-row inflatable rear belts. Rear seat passengers – often children or mature passengers – can be more vulnerable to head, chest and neck injuries. Ford’s unique inflatable rear belts spread impact forces across more than five times the area than conventional seat belts, reducing pressure on the chest while helping to control head and neck motion. Belt comfort should also help increase usage rates. Studies show inflatable belts to be more comfortable for passengers due to padding. From the boron front bumper beam through the hydroformed front frame rails and high-strength steel side-impact tubes, Explorer’s rigid body structure is designed to provide robust protection for occupants. In the instance of a crash, these elements come together to protect Explorer driver and passengers inside a safety cage of strength. The 2011 Ford Explorer redefines customer expectations for driving dynamics and comfort – on any road, anytime, anywhere – while stretching the breadth of SUV capability. Transforming Explorer’s driving quality was central to creating an SUV for 21st century customers. The theme of the all-new Explorer dynamics development was balance. The team sought to provide an engaging driver experience in harmony with the extended breadth of 4WD capability to build driver confidence. The shift to a unibody construction platform enabled a reduction in road noise and significantly decreased Explorer body roll in dynamic cornering situations. Independent front suspension is of the short- and long-arm configuration with a 32-millimeter front stabilizer bar. Independent rear suspension is the SR1 configuration, so-named for its one-to-one shock absorber ratio, which enables precise ride control. Explorer’s EPAS system allows for variable rates of assistance based on speed, turn-in and direction. In addition to optimized steering feel, tight on-centering and appropriate resistance, EPAS provides a fuel economy benefit in comparison to traditional hydraulic power assist systems. EPAS also enables a competitive turning radius for optimum maneuverability in parking situations, combined with increased assistance at low speeds for parking ease. EPAS allows for the addition of Curve Control, a new feature that senses when a driver enters a turn too quickly and applies brake pressure to stabilize the vehicle. In addition, EPAS enables the optional active park assist technology. When activated, the system scans for a suitable spot, calculates the trajectory, and steers the vehicle. The driver continues to control brake and throttle inputs, but the system steers the vehicle throughout the parking maneuver. 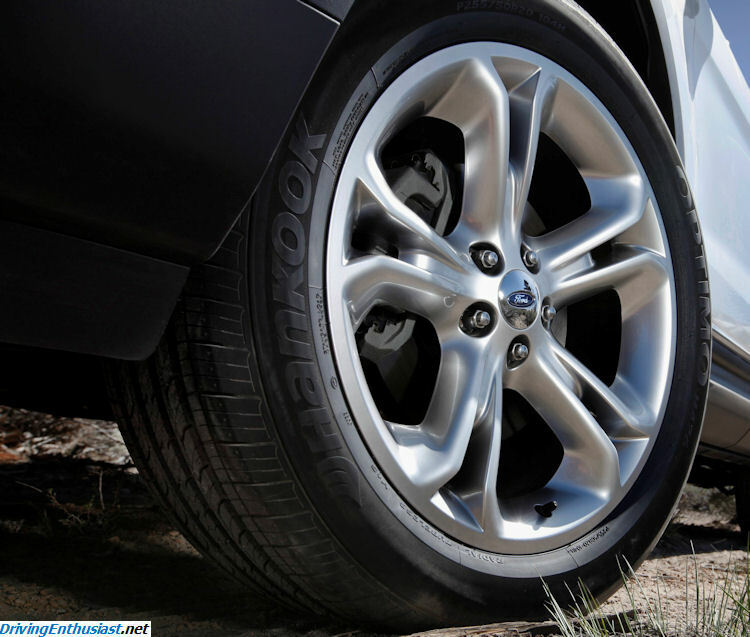 The key to Explorer 4WD capability is Ford’s new terrain management system. Replacing the traditional SUV transfer case configuration, the new system takes the guesswork out of maximizing 4WD and the capabilities it enables. Rather than employment of four-high, four-low and auto settings, Explorer terrain management is selectable by situation. The four settings – available by shift-on-the-fly – include normal, mud, sand and snow. Each setting provides unique engine behavior, throttle tip-in, transmission shift scheduling and calibrations for traction and stability control systems. Terrain management also includes Hill Descent Control™, which provides engine braking to increase driver confidence and control when descending a steep incline. Explorer models with V6 power are rated to tow a maximum of 5,000 pounds. To aid with hookup – especially when alone – a reverse camera with zoom-in functionality is available, allowing a driver to back up to the trailer on-center. The Explorer towing package includes trailer sway control – a stability package shared with the Ford F-150 pickup – to help minimize trailer sway. Trailer brake controller wiring is also included, as is a tow/haul mode. Engaging tow/haul mode increases engine braking to help slow the vehicle and trailer when descending steep grades. The all-new Explorer is available in three trim series levels – base, XLT and Limited. Each offering presents a robust array of standard features, with a class-leading selection of additional convenience and connectivity options so a buyer can tailor a new Explorer to his or her individual needs and desires. The 2011 Explorer will be assembled at Ford’s Chicago manufacturing facility. Production begins late this year, and Explorer will be available in dealerships this winter.